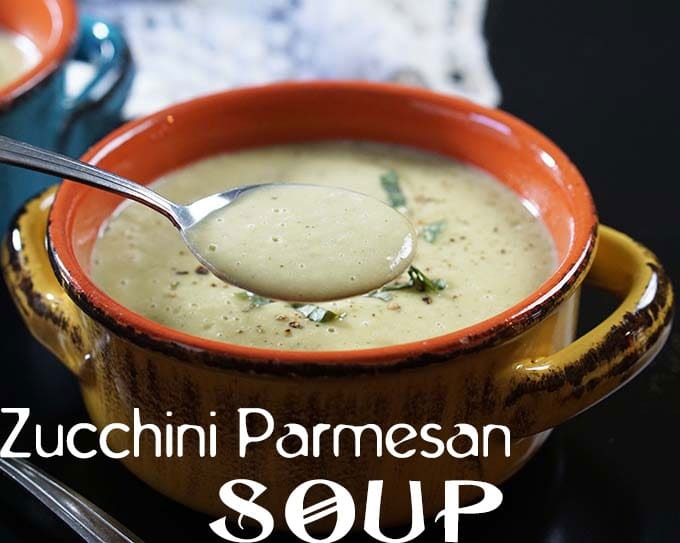 A hearty zucchini Parmesan soup made with fresh zucchini. Its a hearty and warm soup that you can curl up with in front of the fire. Editors Note: Today’s post is a guest post by the wonderful Debra Clark. She writes a great food blog at Bowl-Me-Over. My name is Debra Clark and I am so excited for the opportunity to guest post on the Healing Tomatoes blog! I went back and forth about what to make….I wanted to make something that included tomatoes….but I wanted to also make something in a bowl. Since it’s nearly fall and I’m already starting to think about soups and stews. I decided upon the best of both worlds…a Tomato Tart with a delicious bowl of Zucchini Parmesan Soup! Mmmmm!!!! Are you a soup person? Does it have to be cold outside for you to enjoy soup, or do you eat soup during the warm summer months? I am from the Central Valley of California. There are not many cold winters here! Our average winter temperatures rarely get below 60. I usually do not even wear long pants the entire winter! And for me, I enjoy a great bowl of soup all year long. Soup is good food! 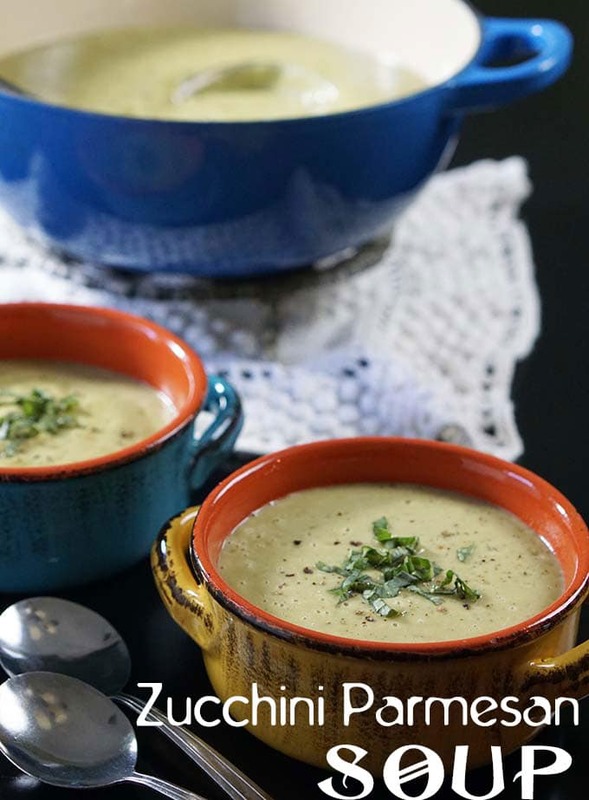 Zucchini Parmesan Soup – for the soup, you’ll start with leeks. If you haven’t used leeks before, they come with a dark green top, that you remove & then the best thing to do is to slice the leek in half and then rinse well. Leeks grow in the earth and will collect dirt and grime in-between the layers. No worries! Just rinse them thoroughly. The other veggies you’ll need is zucchini, Yukon gold potatoes and mushrooms. Take all of these ingredients and saute them in a couple pats of butter & olive oil. You want them to be soft and aromatic, not brown, so low and slow – saute for about 10-15 minutes, add some salt, pepper and just a touch of red pepper flakes. After 20 minutes, add about three cups of Vegetable Broth. You’ll want just enough to cover the veggies. Increase the heat to medium high. Cover and boil until the potatoes are tender. At this point, you’ll simply puree the soup until it has a smooth and silky consistency. You may need to add some additional vegetable stock. When you’ve finished the puree, add in Parmesan cheese and stir until it’s melted. 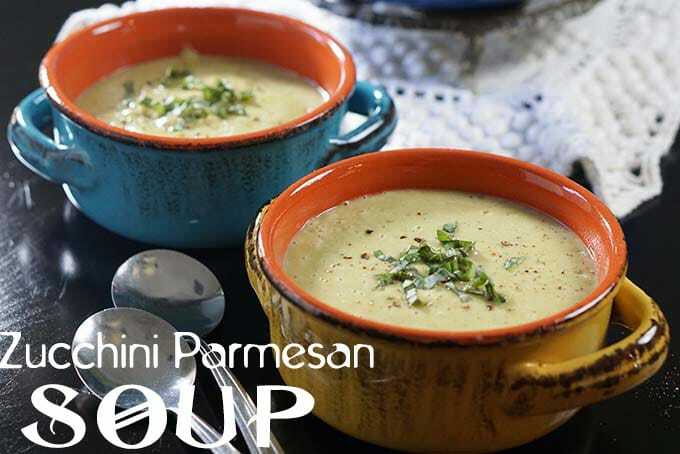 That’s it – simple and delicious, this soup is done in 30-35 minutes and is the creamiest, complex soup – minus the cream and calories! 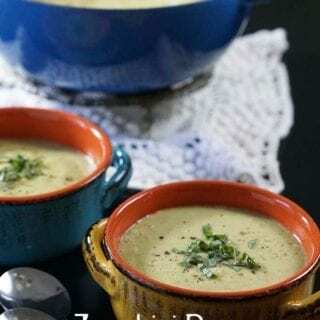 I hope you enjoyed Zucchini Parmesan Soup Recipe! Also check out this Tomato Relish recipe I made. Its a recipe passed down to me by my great grandmother and it is the most delicious appetizer recipe ever! You won’t need ketchup again. 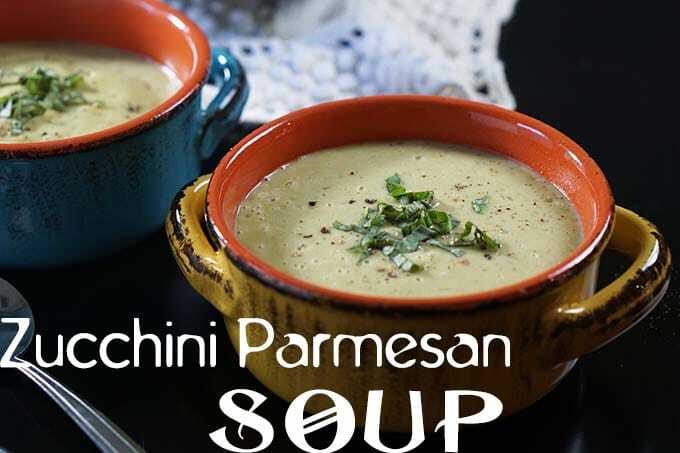 Zucchini is not just good in a warm soup. 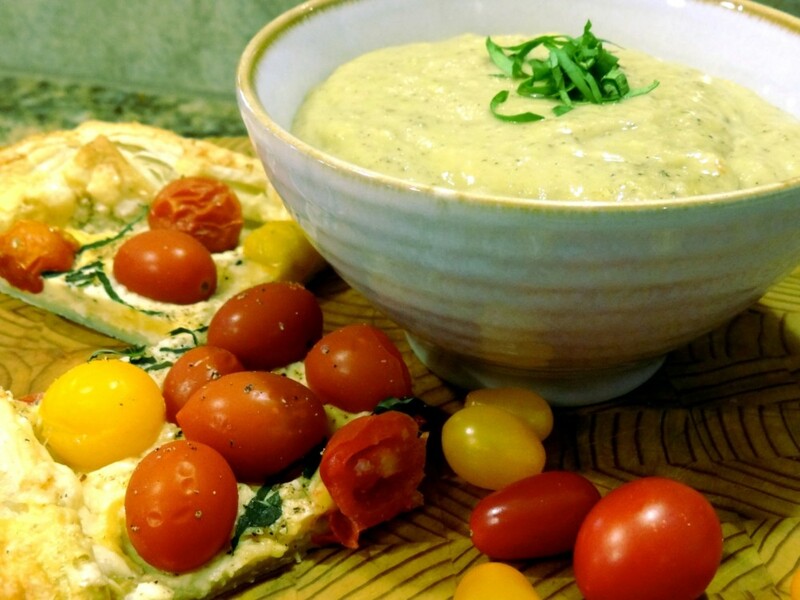 Try my zucchini gazpacho recipe. What’s your favorite comforting soup? Did you do a double take? 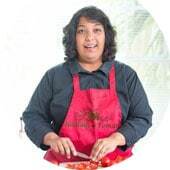 Occasionally, I will revisit previous recipes and do a makeover on them. You probably came to this page based on the photo to the left? However, I decided to re-vamp the recipe and bring you the new version you see above. I think you will like this version just as much. Slice the zucchini in half and then into one inch pieces. Peel the potatoes and chop into one inch pieces also. Remove the stems from the mushrooms and quarter them. In a large stock pot over medium heat, add the butter & olive oil. Season with salt, pepper & red pepper flakes. Sauté the veggies, stirring occasionally for about 10 minutes or until they just begin to soften. Increase the heat to medium high and bring to a boil. Add in the Parmesan cheese and stir until it is melted. This looks amazing, I can’t wait to give this a try! YUM! What a delicious recipe. It is a treat to get to see a guest blogger and check their site out as well. Thank you,Sandi. Appreciate the kind words and the support! Both of these look absolutely amazing. I want the tart, no the soup, not the tart…I can’t pick which one I want more…So I guess I better have both. This looks perfect for an end of summer/beginning of fall kind of meal. Both of these sound fantastic!! Thank you, food hunter. Debra did a great job on the post! Wow, talk about perfect for my overflowing garden! Thanks for the recipes! YUM Pinning! It was a bountiful visit to the Farmer’s Market that inspired that these recipes for me. Glad you enjoyed it! I love this! I’m always looking for recipes to use up zucchini, and this year I have an over abundance of cherry tomatoes (I was just asking my husband what in the world I should do with them!). Pinning, and planning to make! Thanks! Thank you, Jamie! This will be a fun recipe to make!! Wonderful Jaimie – I hope you really enjoy both recipes!